신라 때 돌로 쌓은 산성으로 능선을 따라 5각형에 가까운 형태를 띠고 있다. 현재 성 안의 특별한 시설물들은 확인되지 않고 있으며 성의 내력에 대해서는 『하동군읍지』가 유일한 자료이다. 이 기록과 성의 위치 및 규모로 보아 신라가 군사적 목적으로 쌓은 것으로 보인다. 최근에는 5세기 전반 고구려 광개토왕이 신라를 거쳐 왜군을 토벌하면서 남하했을 때 쌓은 고구려 계통의 성으로 보는 의견도 제시되고 있다. 성벽은 네모나게 다듬은 돌과 자연석을 사용하여 견고하게 쌓았다. 산성의 동·북·서·남면은 성벽이 거의 완전하게 남아있으나, 서남쪽 섬진강을 굽어보는 구간은 거의 허물어져서 돌무더기만 남아있다. 지리산의 험한 산줄기를 뒤에 두고 섬진강이 앞을 가로막는 천연의 요새로서 남해에서 호남지방으로 들어가는 중요한 길목이다. 이러한 지형을 이용하여 크고 견고하게 지은 산성이다. Made by piling the stones, this fortress of the Silla Period is shaped like a rough pentagon along the ridgeline of the mountain. 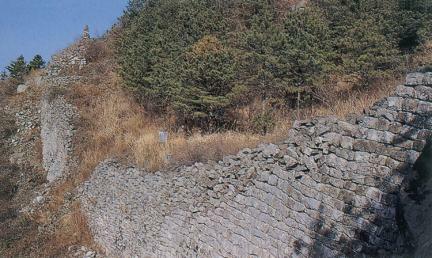 The buildings inside the fortress are now gone, and the only known fact about the fortress is its location, Hadong-gun. Based on the location and the scale, it is believed to have been built by the Silla military for military purposes during the Three Kingdoms Period (Silla, Goguryeo, Baekje). Still, another assertion is that it was constructed by the Goguryeo military when the Great King Gwanggaeto of the Goguryeo Dynasty advanced southward to suppress the Japanese aggressors to the Silla territory. 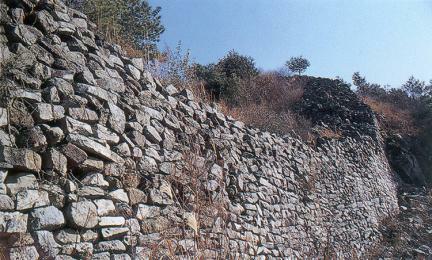 The fortress wall is very solid because it was made of stones polished into square and unpolished ones. 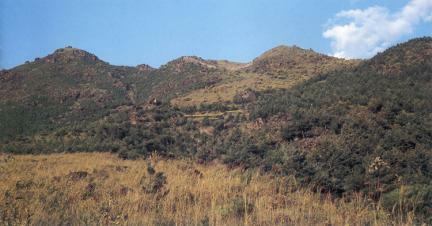 Except the broken southwestern parts, through which Seomjingang River can be seen, the fortress wall is perfectly preserved. 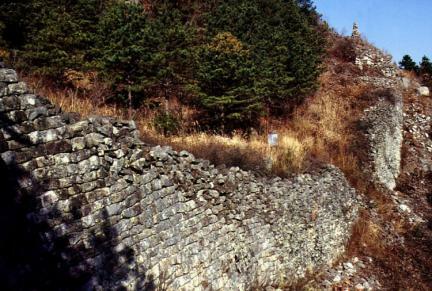 With the rugged range of Jirisan Mountain at the back and Seomjingang River in front, this fortress is a strategic point as well as an important transportation route between Namhae and Jeolla-do provinces. This fortress is a typical case of building in large scale and with solidity and reflecting its geographical strong point well.